Allow patients to easily and quickly self check-in. Available in English and Spanish. Patients can sign in using just their name and date of birth, and all of their medical and insurance you have on file will automatically populate on their chart. Once a patient’s check-in information is approved, their information is synced to their EHR record, eliminating the need for data entry work. It’s an easy and convenient process for both your staff and patients. 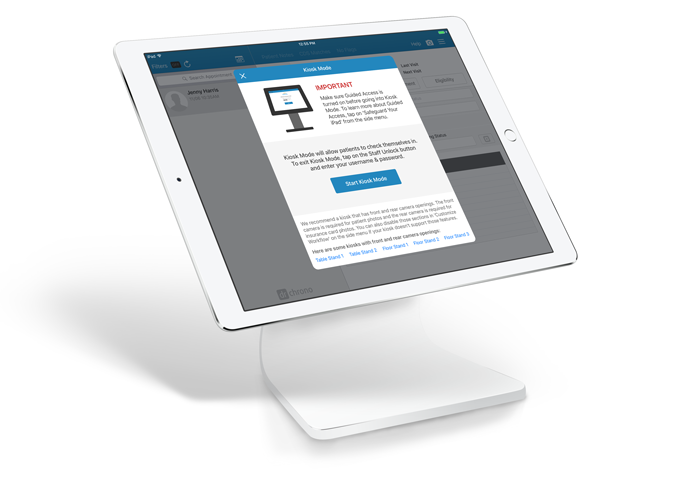 You can simply hand patients an iPad from your front desk, or mount a Kiosk stand and allow them to self check-in. Design a check-in process most suitable to your practice. Patients can sign any consent form on the iPad. You can add any consent forms to automatically pre-populate for a specific appointment type. The front and back camera can be used to capture insurance information or the patient’s portrait.